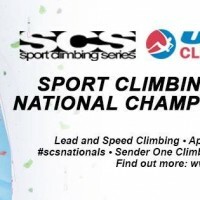 After an exciting qualifying round, we’re down to 8 men and 11 women1 for tonight’s SCS Nationals Finals which get underway at 6:30 PM PDT. The qualifying round saw Vasya Vorotnikov really throw down the gauntlet on the men’s side as he was the only male competitor to top out qualifier B, and he got high point for the men on qualifier A. He’s got a stacked field behind him though that includes past national champions like Daniel Woods and Carlo Traversi, and really any 8 of the men in finals could win this thing. For the women, it was defending national champion Delaney Miller with the only top in the qualifying round with multi-time national champion Sasha DiGiulian and Claire Buhrfiend close behind. The youth trend continues for the women with over half our finalists not yet 20 years of age, so it will be interesting to see that dynamic play out under the pressure of the bright lights of finals. Tune in here tonight at 6:30 PM PDT to see who our national champions for 2014 will be!